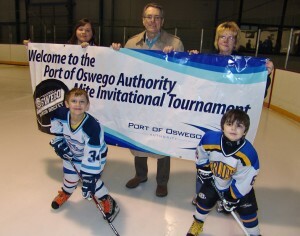 The Port of Oswego Authority Mite Invitational Hockey Tournament will hit the ice February 19-21 in Oswego. The 24th annual Oswego Minor Hockey Association (OMHA) tradition will include four Oswego teams, as well others from throughout New York State and Canada. Shown pictured at a Mite Practice recently are from left to right back row: Jennifer Shepardson, Tournament Committee Member; Terry Hammill, Port of Oswego Authority Board Chairman; and Alicia Graham, Tournament Committee Member. Shown representing the OMHA Mite Teams are from left to right front row: Brandon Graham, of Oswego Sub Shop and Lucas Shepardson of RudyÃ¢â‚¬â„¢s. OSWEGO, New York – The Port of Oswego Authority Mite Invitational Hockey Tournament will take place February 19-21 at the Crisafulli and Cullinan Ice Rinks in Oswego. The Port of Oswego Authority has once again partnered with Oswego Minor Hockey Association (OMHA) as the major sponsor for the 3-day event, according to Terry Hammill, Chairman of the Port of Oswego Authority Board of Directors. The OMHA Mite Program will be represented in the tournament locally by teams sponsored by Oswego Sub Shop, RudyÃ¢â‚¬â„¢s Lakeside, DominoÃ¢â‚¬â„¢s Pizza, and RabyÃ¢â‚¬â„¢s Ace Home Center. 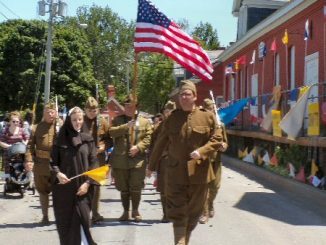 11 additional teams in the field are from all areas of New York State, as well as one team from Canada. For additional information on the 2010 Port of Oswego Authority Mite Invitational Hockey Tournament contact Graham at (315) 343-2827, or visit the Oswego Minor Hockey Association website at www.oswegohockey.com/tourninfo.htm. All games are free admission and open to the public. The Port of Oswego is the first U.S. port and first deepwater port on the Great Lakes from the St. Lawrence Seaway and is accessible from virtually any international port in the world. The port was officially commissioned in 1955 but has been a major driver in local and national commerce since the 1800s. The Port is open 24 hours a day, seven days a week to accommodate vessels from all ports on the Great Lakes and around the world. The port entrance depth is 27 feet, a width of 750 feet, a turning basin of 115 acres, and it has no restrictions on beam length for ships entering the harbor. A U.S. Customs Service office is maintained on site to facilitate the movement of legitimate international cargo by rail, truck and water. For more information, contact the Port of Oswego Authority at 315-343-4503 or visit www.portoswego.com.